Last year around this time I was in search of a new eye shadow brush set. I have a lot of other brushes for face that I use but didn't really have any good quality brushes for eyes. I wanted something that would be novice friend and not break the bank. Enter Kat Von D Eye Brush Set. 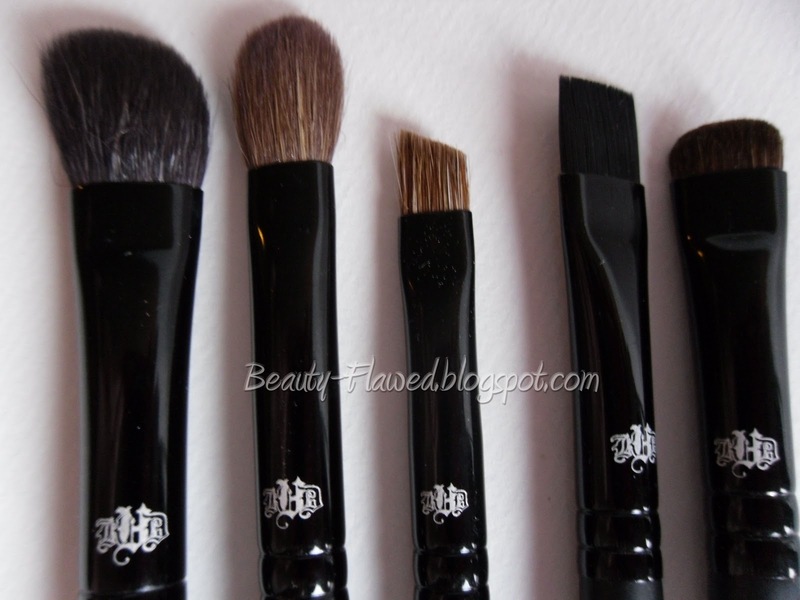 These are a great starter set for anyone who is on the fence about buying better brushes. They are a good value at $48 usd and are a very nice quality with interesting details. 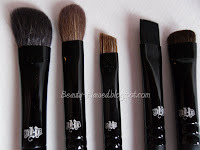 The brushes themselves are very soft and easy to use. Not 100% sure what they are made of I have heard natural hair but I can't find any solid information about that. I purchased these over a year ago and have thrown away the box otherwise I would check that. 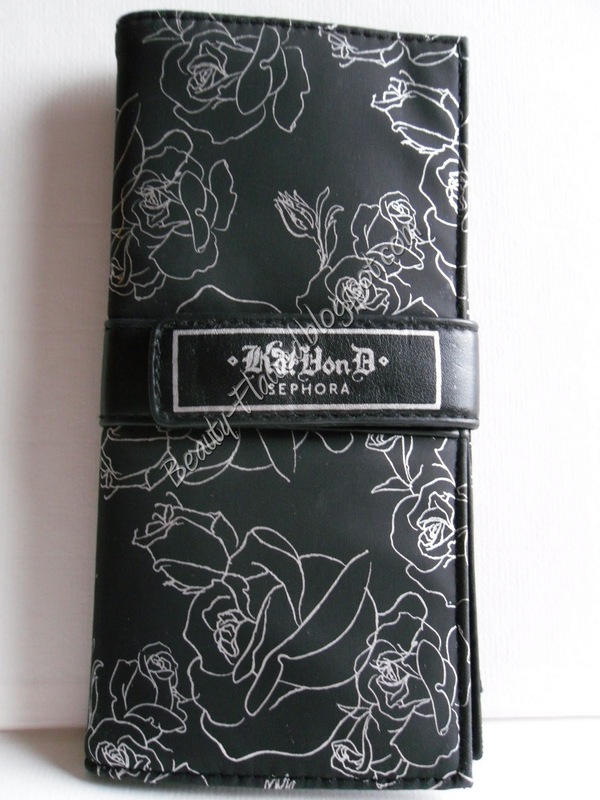 They also come with a great carrying case its a vinyl like material and not only is it durable but it is really easy to clean. I get eyeshadow all over it all the time and a little brush cleaner and a paper towel and it cleans up just fine. Another added detail that I really like about these is the rose design that is on them, I think it makes them quite attractive to the eye. I wash these regularly with deep cleaning them at least once a month and they have not lost much of their shape from just lying out and drying flat. As far as size I would say that these fall into a medium length category. They are not full size brushes in comparison to MAC or other brush companies. I would say these are more of a medium length, they are much bigger than tiny travel size brushes. Overall I think these are a great product for the price point and quality. These are great for traveling because even tho they are a medium size they still fit easily into your purse and they clean up well. 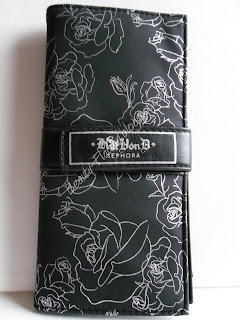 I've been wondering about these Kat Von D. brushes. They're so gorgeous, but I hadn't heard anything good about the cosmetic line, so I assumed the brushes weren't any good. But... now I gots to check them out! 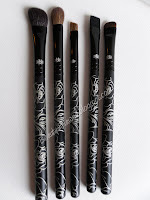 I like the designs of the brushes, but I have never actually tried one -- mainly because I hate Kat Von D.
How well do they apply the actual makeup product? They pick up product really well I'm in the habit of always tapping my brushes and when I do that I get little to no fallout. I usually only have to go over the eyeshadow I'm using twice to pick up the amount of product I need. Unless it is a lighter shade it tends to take more strokes.